WATERTOWN, Mass. and ZIJTAART, the Netherlands, October 9, 2018 - Exergen Global today introduced the D501LN, a handheld certified infrared scanner that provides all the features found in Exergen’s DX501, with an extended nosepiece to enhance safety and ease-of-use. The length of the nosepiece in the D501LN is 1.75” (44.45 mm), while the DX501 nosepiece was 0.75” (19.05 mm). The increased length not only allows operators to hold the scanner 1” further away from a hot target, it also makes it easier to measure hard-to-reach areas. The D501LN will have Automatic Emissivity Compensation identical to that of the DX501, because the diameter of the nose piece and the reflective cup inside it are the same size in both scanners. 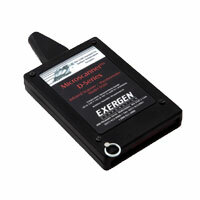 Like the DX501, the D501LN is designed to deliver the industry’s best possible temperature measurement accuracy. The scanner is the only infrared instrument that can be certified with NIST-traceable accuracy on real surfaces of unknown emissivity, and is completely free of the contact, friction heating, time-based and heat syncing errors common in contact devices. The D501LN non-contact scanners measure surface temperature in a fraction of a second, while contact probes (thermocouples, RTD’s, thermistors, etc.) require several minutes to achieve equilibrium. The scanner is free of any emissivity errors, emissivity shift errors or background reflection errors. The devices do not require any calibration or user adjustments, and have an interchangeability rate of ±1%, resolution of 0.1°C and unmatched repeatability of 0.1°C. Exergen Corporation, the global leader in industrial and medical non-invasive temperature technology, provides non-invasive temperature measurement devices providing lower cost, higher accuracy, less invasiveness, and greater reliability than ever previously possible. Exergen is well-known for its award-winning temporal artery thermometer in the healthcare and consumer market. The company was founded by Harvard Research scientist Dr. Francesco Pompei who holds over 75 patents. Exergen Corporation is based in Watertown, Massachusettes, U.S. Exergen Global, an HP Strategic Partner for 2017, is the worldwide solutions provider of Exergen Corporation’s industrial non-contact infrared temperature sensor solutions and the recipient of the 2015 Global Frost & Sullivan Entrepreneurial Company of the Year Award.